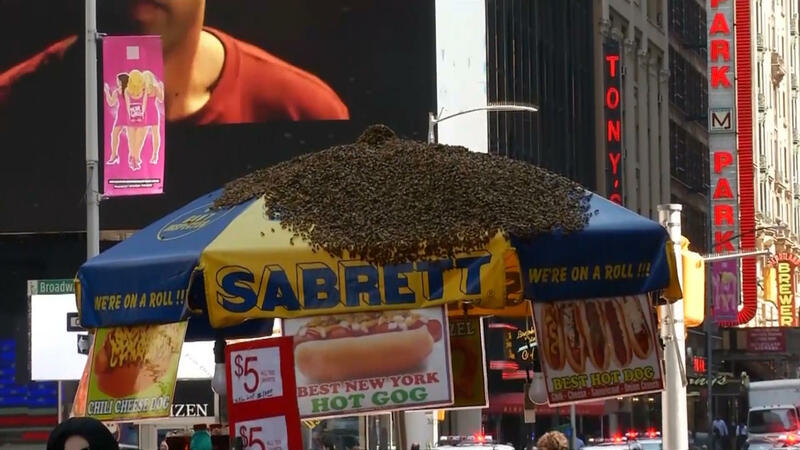 New York City is abuzz about a swarm of bees that took over a hot dog cart in Times Square Tuesday afternoon. Fortunately, a police officer who is also trained as a beekeeper swooped in to remove the swarm and no injuries were reported. The honeybees descended on a food cart umbrella near the corner of 43rd Street and Broadway around 2 p.m., CBS New York reported. The NYPD beekeeper responded to the scene with a special vacuum device and collected the critters in a humane fashion. Once collected, the bees were taken outside of Manhattan and released at an apiary — a facility housing beehives — on Long Island, the police department said. Experts say a swarm of bees this size is a rarity in the city, but not entirely unheard of. "Usually bees swarm because they're overcrowded or it's too hot and there's a lot of overcrowding in New York," beekeeper Andrew Coté said. "Generally when honeybees swarm, they're mostly docile. They're not defensive, not interested in stinging at any time — particularly when they swarm." The incident also sparked interest in the NYPD beekeepers, a little-known unit within the department that maintains its own bee-centric Twitter account, @NYPDBees. "The department had a beekeeper in place since 1995. It's the biggest, little unit within the NYPD. We cover all 5 boroughs 24/7. We respond to honeybees and hornet nests for removal as well," they posted on the account. The hero in Tuesday's Times Square incident was identified as Officer Lauriano, who's been a beekeeper for the NYPD for just a year and has been raising honeybees at his own apiary for almost five years now, @NYPDBees said. The group happily responded to questions Twitter users posted about the operation, noting that it was "Really catching a lot of buzzzz. Not many things can surprise New Yorkers, but this one sure did!!!" @NYPDBees explained that the Times Square swarm was an example of "a late, very late seasonal swarm," likely spurred on by this week's extremely muggy weather. "With the heat humidity today, they swarmed because of the hive was overcrowded and they were unable to keep cool. That was a full colony swarm from the looks of it. Lot of bees," they wrote. The vacuum device used to collect the bees has low suction and does not harm the animals, they said. Where did all those bees come from in the first place? "There are many beekeepers in NYC and rooftop beekeepers as well," according to @NYPDBees. For the NYPD beekeepers, it was all in a day's work. "I cannot say it was a sting operation, because no one got stung," they wrote.